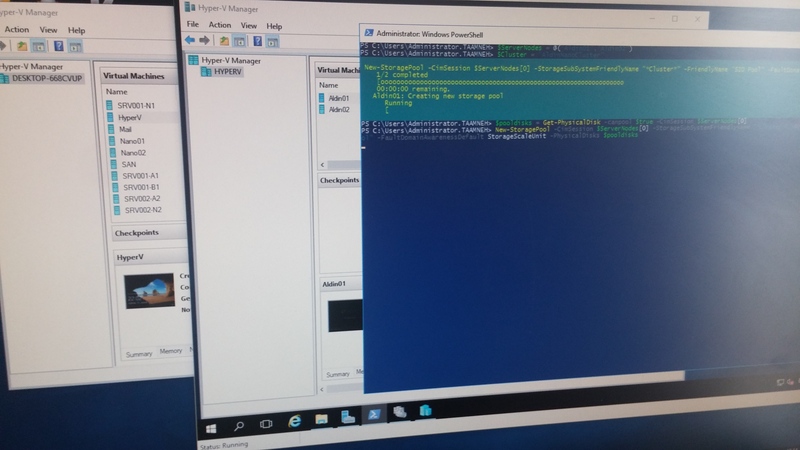 This script creates a Nano Server VHD image for each machine called Aldin01, Aldin02. I set also the domain and the IP address. 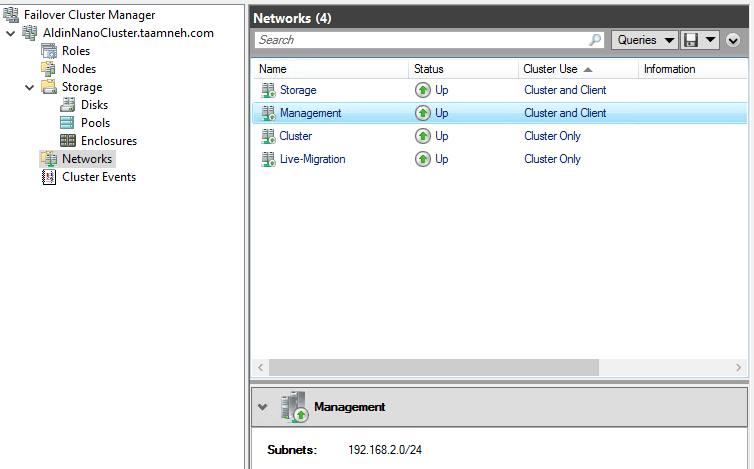 I add cluster feature, guest drivers, storage and Hyper-V features. Script also creates two virtual machines called Aldin01, Aldin02. These Virtual Machines will be stored in C:\LocalVMs\. These Virtual Machines are with 2 vCPU and 4GB of static memory. Then I add a second network adapter to make a teaming inside the Virtual Machines (with Switch Embedded Teaming). So I enable Mac Spoofing and the Teaming on Virtual Network Adapters. We can simulate HDDs by placing the VHDX files respectively on local SSD or HDD drives. 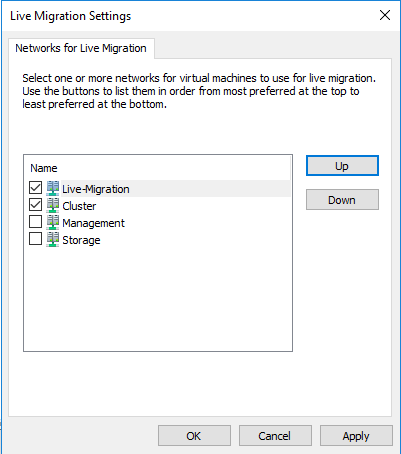 To configure network, I will leverage PowerShell Direct. To use it, just run Enter-PSSession –VMName <VMName> -Credential <VMName>\Administrator. Once you are connected to the system, you can configure it. I have written one script to configure each Nano server. The below script create a Switch Embedded Teaming, set the IP Addresses, enable RDMA (more on RDMA). Use this script on both Nano Servers and change variables as needed. #Validate cluster Test-Cluster -Node "Aldin01", "Aldin02" -Include "Storage Spaces Direct", Inventory,Network,"System Configuration"
Test-Cluster -Node "Aldin01", "Aldin02" -Include "Storage Spaces Direct", Inventory,Network,"System Configuration"
If you get any error you can check test report. 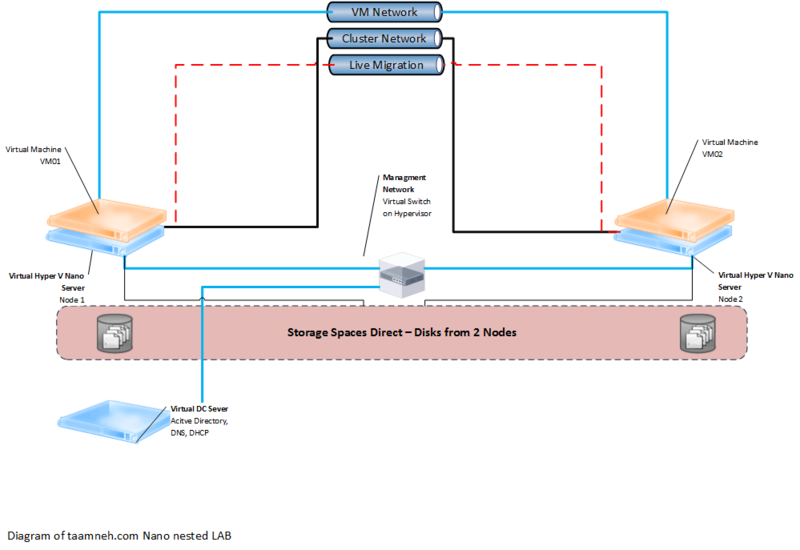 (Get-ClusterNetwork -Cluster AldinNanoCluster -Name "Cluster Network 1").Name="Management" (Get-ClusterNetwork -Cluster AldinNanoCluster -Name "Cluster Network 2").Name="Storage" (Get-ClusterNetwork -Cluster AldinNanoCluster -Name "Cluster Network 3").Name="Cluster" (Get-ClusterNetwork -Cluster AldinNanoCluster -Name "Cluster Network 4").Name="Live-Migration" (Get-ClusterNetwork -Cluster AldinNanoCluster -Name "Storage").Role="ClusterAndClient"
(Get-ClusterNetwork -Cluster AldinNanoCluster -Name "Cluster Network 1").Name="Management"
(Get-ClusterNetwork -Cluster AldinNanoCluster -Name "Cluster Network 2").Name="Storage"
(Get-ClusterNetwork -Cluster AldinNanoCluster -Name "Cluster Network 3").Name="Cluster"
(Get-ClusterNetwork -Cluster AldinNanoCluster -Name "Cluster Network 4").Name="Live-Migration"
(Get-ClusterNetwork -Cluster AldinNanoCluster -Name "Storage").Role="ClusterAndClient"
Then I change the Live-Migration settings in order that the cluster use Live-Migration network for Live-Migration usage. I don’t use Powershell for this step because It is easier to make it by using the GUI. Then I configure a witness by using the file share witness and files share I prepared earlier but in this place you can use new feature in Windows Server 2016 the Cloud Witness. We enable it here, to see all local disks from all nodes, because for virtual lab we have to create the Storage Pool manually. 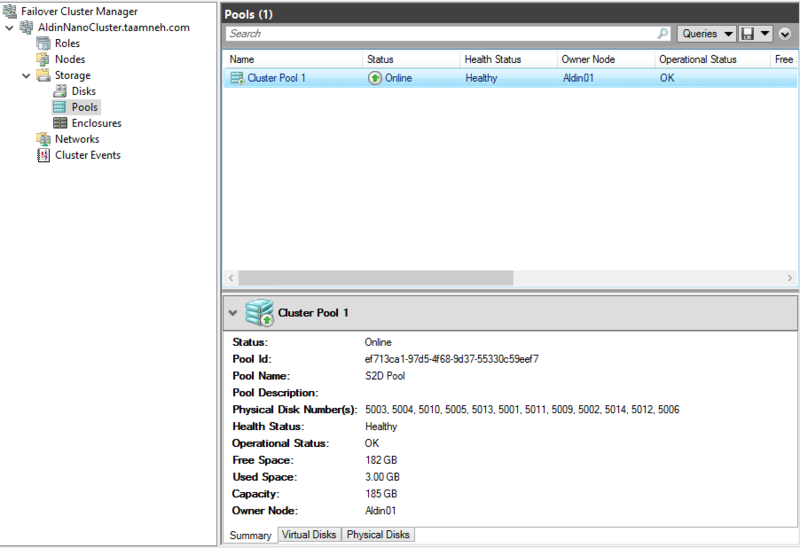 If I come back in the Failover Cluster GUI, I have a new Storage Pool called S2D Pool. Then I create one volume in mirroring. It has 1 column. Volume is formatted in ReFS and size is maximized. The more columns means more performance because multiple disks will be engaged at once in Read/Write operations, but it’s also limited in flexibility with expanding existing virtual disks, especially in tiered scenarios. Typically the column count will be equal to the number of physical disks of the storage space (for simple spaces) or half of the number of disks (for mirror spaces). The column count can be lower than the number of physical disks but never higher. The more is better in terms of performance, but the less is better in terms of flexibility for future expansion. 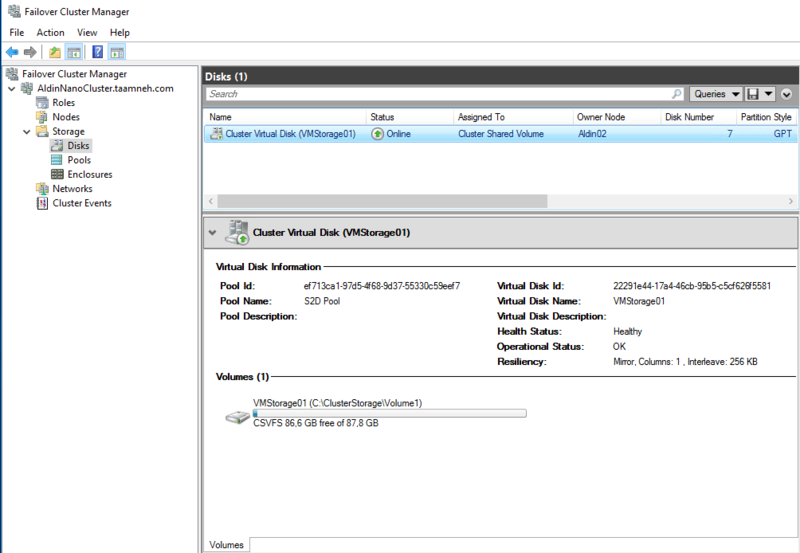 Now I have Cluster Virtual Disk and it is mounted on C:\ClusterStorage\Volume1. The Interleave parameter represents the amount of data written to a single column per stripe. The default Interleave value is 262,144 bytes (256 KB). So I create a Virtual Machines and I use C:\ClusterStorage to host VMs files and this is it. This scenario is a great flexible solution. As you have seen above it is not so hard to install. However, I think this solution needs a real hard work to size it. It is necessary to have strong knowledge on Storage Space, networks and Hyper-V. In my opinion, Nano Servers are a great solution for this kind of solution because of the small footprint on disks and compute resources. Inception comes to mind when you see this image above. It was very interesting lab to tinker with and I hope you will find this posts useful. If you find some stuff missing or you have some suggestion how this lab can be done better or be upgraded please write a comment or drop me mail. Great article and nice job!!! I added your blog in my favorites sites. I had trouble using the first script with the Nano Image and VMS’ creations so I had to create them manually and join them as well, the script kep telling me that such a domain does not exist (my domain of course). After the creation of the virtual machines I used the second script to add all the VHD’s and it worked. Both Nano Servers are domain joined and have two network adapters with mac spoofing enabled and are using a virtual switch configured in Internal mode. 1. How do I use your third script for the network part so it would work with an Internal switch? 2. It seems it creates another virtual switch in external mode with os managenment, can it be configured differently for a lab by using an internal one? 1. I am sorry but you can not use it with internal switch as script is written to utilize Switch Embedded Teaming and If you want to use NIC Teaming in a VM, you must connect the virtual network adapters in the VM to external Hyper-V Virtual Switches only; virtual network adapters that are connected to internal or private Hyper-V Virtual Switches are not able to connect to the switch when they are in a team, and networking fails for the VM. 2. Idea was to use Switch Embedded Teaming and enable RDMA for performance boost and that is my recommendation but I guess that you can rewrite huge portion of script to work in different setup but you must be aware of cluster network recommendation if you are attempting to create cluster and read this article I think it will help you better understand all this.